Waldkirch, November 2018 – Instead of rigid enclosure profiles with fixed sender and receiver modules SICK offers a flexible “light chain” of cascading sensors that can be flexibly positioned, easily connected, and centrally evaluated – this is the newly designed concept behind the FlexChain detection system. The only one of its kind in the world, which will be presented for the first time at the SPS IPC Drives trade fair held in Nuremberg from November 27 to 29, 2018 (hall 7A, booth 340). The up to 60 individual beams of this flexible light grid can not only be arranged independently of one another, but also generated by either through-beam photoelectric sensors, photoelectric retro-reflective sensors, or photoelectric proximity sensors – including in a mixed configuration. The cascading of sensors connected to a common FlexChain host minimizes cabling costs. Detailed real-time diagnostic information on the status of each individual sensor can be evaluated in the compact central unit, directly, or forwarded to a control at any time via IO-Link. This ensures maximum detection reliability and measurement certainty, as well as consistent system and machine availability. Free positioning of sensors, individual beam separation, various detection methods and sensing ranges, as well as an easy way of subsequently adding more sensors into the cascade – FlexChain represents a paradigm shift in how automation light grids are designed and used. A FlexChain system may be configured from up to 60 sensors. Similar to a light chain, these are cabled as a cascade using pigtails in customizable lengths, minimizing electrical installation effort compared to individually wired photoelectric sensors and making the process of integrating the sensors into a plant much simpler. 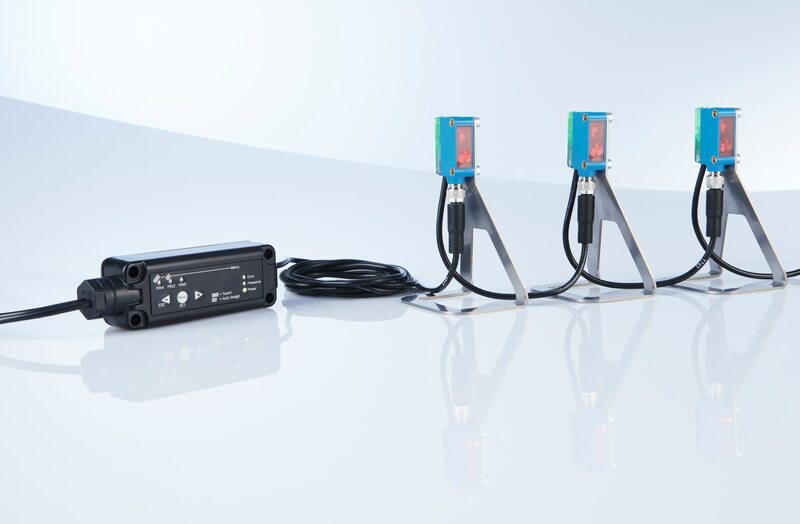 The flexible sensor system is controlled via the FlexChain host, which is a compact central unit with a CANopen fieldbus interface, an RS-485 interface, and an IO-Link connection for flexible integration into the machine or plant’s control environment. The FlexChain operates like a light grid. It achieves maximum measurement certainty and detection reliability irrespective of how the sensors are arranged and how far away they are from each other; this is because the individual beams cycle sequentially at a rate of 200 µs, which prevents sensors from mutually interfering and sensor signals from being superimposed, even if the optics modules are mounted extremely close together. Incorrect measurement data and output signals are thus safely avoided and the light grid runs reliably all the time. In contrast to conventional light grids, the innovative FlexChain concept allows the different sensors to be positioned individually, making it possible to vary the beam separation according to the application. A FlexChain system also enables measuring ranges and detection zones of different widths to be set up within a single task. 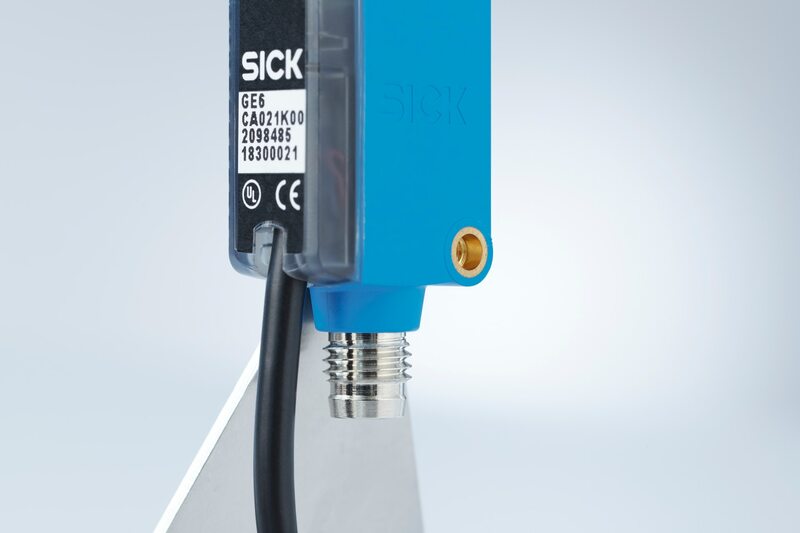 What’s more, the user is totally free to choose the best detection principle for their needs: through-beam photoelectric sensors, photoelectric retro-reflective sensors, or photoelectric proximity sensors from the G6 family of sensor products (which have been fitted with a special ASIC for the flexible light grid) can be integrated into the FlexChain. They can even be used in combination with each other. Therefore, the FlexChain is a system that offers a great deal of freedom when it comes to design and installation – while also avoiding the disadvantages of conventional photoelectric sensor solutions. The FlexChain light grid can be commissioned immediately via the two-button display of the host module. All connected sensors are identified, addressed, and taught-in automatically at the touch of a button. It is also possible to configure application-specific logics in the host. Customized parameterization can be performed via USB with the aid of the SOPAS SICK software tools. The sensor data can either be evaluated in the system directly or forwarded to the control. FlexChain also offers a range of real-time diagnostic options in parallel to this – including in relation to sensor parameterization, the degree of contamination of the individual sensors, and current communication behavior within the system. Potential faults are detected early, so failures and downtimes can be prevented efficiently. The innovative concept behind the FlexChain flexible light grid allows up to 60 different sensors to be positioned individually. No other automation light grid currently available offers more freedom in terms of design or installation.